Implemented auto-tune function which will find the best GT value for each GPU. You can activate it by either omitting the -gt parameter in the command line, or by pressing 'z' in the console. Note that auto-tune process takes about 3 to 5 minutes on average and during this time the hashrate will be lower and will go up and down. You can abort the auto-tuning by pressing the 'g' key in the console window. Added support for 'x' key in console window. This will allow you to select a single GPU for manual or automatic GT tuning. Added support for direct mining (without DAG switching for DevFee) of the following coins: Nekonium (NUKO), MIX, EtherGem (EGEM), AURA, Hotelbyte Coin (HBC), Genom (GEN), EtherZero (ETZ), Callisto (CLO). See the -coin option documentation below for details how to specify the coin you are mining. Added -cdmrs option to reload the settings if config.txt is edited/uploaded by a remote manager. This allows you to change and reload the config.txt options via remote manager without access to the console window of the miner. Added option -acm to turn on AMD compute mode on the supported GPUs. This is equivalent of pressing 'y' in the miner console. Added option -gpureset, which forces full reset of the GPU when the miner is paused (or before DAG generation when switching DAG epochs). This is designed to avoid problems like the hashrate drop of GeForce GTX1080 Ti after pause/resume. This option can be specified per GPU and is turned on by default for GTX1080 Ti. Added option -gser for serializing of DAG creation if your PSU(s) can't take all GPUs generating DAG simultaneously. minutes the miner will mine for us, its developers, for 35 seconds. interactively with the + and - keys while the miner is running). files with the notable exception of the dual mining feature (yet). * Supports devfee on alternative ethash currencies like ETC, EXP, Music, UBQ, Pirl, Ellaism, and Metaverse ETP. This allows you to use older cards with small VRAM or low hashate on current DAG epochs (e.g. GTX970). * Full compatibility with the industry standard Claymore's Dual Ethereum miner, including most of command-line options, configuration files, and remote monitoring and management. the future but it may take some time. soon. Solo mining is supported since version 2.7c. interactive commands are also listed at the end of the following section. so you can use the same command line options as the ones you would have used with Claymore's miner. set to 0 to disable automatic switch back to primary pool. -bench [<n>],-benchmark [<n>] Benchmark mode, optionally specify DAG epoch. Use this to test your rig. -cdmrs Reload the settings if config.txt is edited/uploaded remotely. Note that most options require restart in order to change. (-tt, -fanmin, -fanmax, -powlim, -tmax, -cclock, -cvddc, -mclock, -mvddc). -acm Turn on AMD compute mode on the supported GPUs. This is equivalent of pressing 'y' in the miner console. 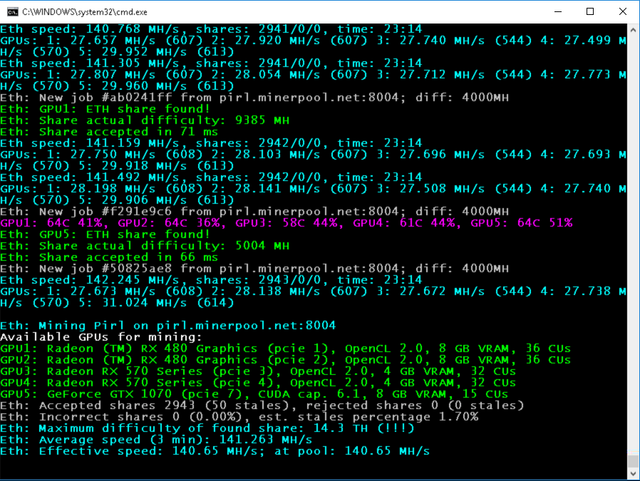 -mi <n> Set the mining intensity (0 to 14; 12 is the default for the new kernels). You may specify this option per-GPU. tuning parameter interactively with the '+' and '-' keys in the miner's console window. -nvf <n> Nvidia kernel sync (0: never, 1: periodic; 2: always; 3: forced; default: 1). You may specify this option per-GPU. -gpureset <n> Fully reset GPU when paused (0 - no, 1 - yes; default: no, except on 1080Ti). You may specify this option per-GPU. put a dollar sign ($) character in the logfile name (e.g. -logfile my_log.txt$). -logsmaxsize <n> Maximum size of the logfiles in MB. The default is 200 MB (use 0 to turn off the limitation). -li <n> Another way to lower the GPU usage. Bigger n values mean less GPU utilization; the default is 0.